Ken Goes Rogue Again! Can The Lone Elephant Cause Havoc In The NPP? They say when an elephant goes rogue he never reforms. 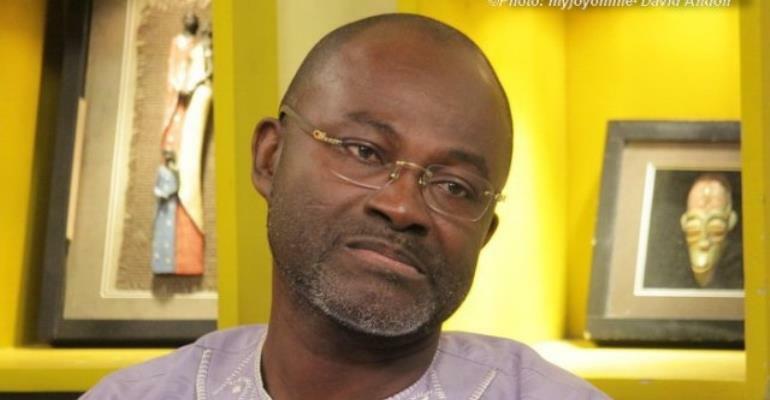 Lawmaker Kennedy Ohene Agyapong is not a dark horse when it comes to tantrums throwing or bad-mouthing his political opponents or even his 'bedfellows'. But the maverick is making the headlines again for the second time in less than three months this year after he was cited or blamed for the death of undercover journalist Ahmed Suale. Currently, Mr. Agyapong is up in arms with his own party members. And it seems he's taken this one to the highest level, beyond repairs. "They feel they're wise but that's all of it," the Assin Central MP has said. Has the calf's tusk grown into his cheeks? Or some individuals have covertly planned to undo him as he seems to suggest in his most recent outburst. "The party [NPP] had not treated me fairly at all. When the Anas video came out, if I tell you the truth, you'll not believe. We're in public I'll restrain myself. They've disgraced me before a crowded parliament. I've had enough I won't run again," he said on an Accra-based radio station on Monday. According to him, the party's leadership had used him as their hatchet man, doing all the tough stuff. "They feel they're wise but that's all of it. They'll take me to Central Region and say, the 23 constituencies Kennedy Agyapong the foolish one should use his money to support. I will not do it again. If I don't tell them then I'm lying," Mr. Agyapong said. Ken says he's had enough. Enough of what my brother? Today Ken. Tomorrow Ken. The guys at Kokompe and Makola market were talking about you yesterday. Personally, I won't cease to praise you (Akompreko) for all the good things you're doing for people and country. Your intervention at Winneba University 's impasse was exemplary, I must say. But I won't also cease to criticize you if you falter. See, you made your day miserable at Windy Bay when you threatened the police officer. Your action in that regard was uncalled for. Who told you, you can fire a police officer? You restrained yourself, isn't it? Yes, you'd. Heaven has ears for the rest...So please keep the cards close to your chest. I remember when Ken criticized KwasiPeter (Special Prosecutor) and said Mr. Martin Amidu would collapse the NPP. Collapse NPP: How is that possible? I wondered. It sounded more outrageous to my ears than the word itself. Indeed, I knew then that something was wrong.I couldn't understand where Ken was coming from and the basis of his ranting.I also had the feeling that the anti-graft crusader wouldn't find things easy at his new office. I saw impediments and I saw machinations. The attacks came from Ken, but did he act alone? Who gave him the ammunition? If Martin fails tomorrow, I will spare him the blame. I will spare him the rod because we're our own enemies. The phrase 'going rogue has become a political byword. In politics, it's often used to describe a person that exhibits maverick-like behaviour. A non-conformist if you like. Is this new to the Elephant family? This, not the first time the Elephant is being roughed up by a family member. The NPP family has produced a few rogues since the beginning of the fourth republic. Tarzan (Dr. Charles Wireko Brobbey) went rogue in 1996 and again in 2012. His comments about the then-vice presidential candidate of the party--Dr. Mahammadu Bawumia cost him (I don't know to what degree) but it probably made him a pariah. He later showed contrition and rendered an unqualified apology to Dr. Bawumia. Dr. Nyaho Tamakloe also went rogue in 2016, attacking the elephant's then-presidential candidate, Nana Akufo-Addo. He labeled him as a violent individual who did not have the qualities of a president. Apple doesn't fall far from the tree, but to many NPP party faithful, these staunch members did fall far away from the tree. I took Dr. Tamakloe on and I didn't spare my uncle Chuck either. In months leading to the historic 2016 general elections the party chairman Paul Afoko, its general secretary Kwabena Agyapong, and 2nd national vice chairman Sammy Crabbe went wrong. Theirs was viewed by the Elephant family as 'calamituous'. They'd crossed the red line and would never find their strong footing. The party is yet to decide its fate. Can the lone elephant cause havoc in the NPP? Ken is one known individual that's bankrolled the NPP, perhaps more than anyone in recent times. Even though I haven't seen or heard about any figures, it's believed he had sunk several millions of Ghana cedis into the party's operation and rebranding in that 2016 elections. True or false he's a force to reckon with. And he brags about it often. But it seems the Father Christmas Man isn't. going to part away from his hard earned monies to the NPP anymore. Another individual that readily comes to mind is the president--Akufo-Addo. Around 1995/ 96 then-candidate contesting John Kuffour, single-handedly refurbished all NPP constituency offices across Ghana. In that regard, Ken is powerful in the party. But he should also remember that one cannot cut one's nose to spite his/her own face. They'd all come in different shapes and sizes. They'd come like a monstrous storm but none of them lasted forever. Indeed, at different times and different seasons, they'd all come. I think it bears repeat, Ghana needs the likes of Ken to buck the status quo and talk about the rot in the system both society and government. But this is not the way to go...lets not undermine the very institution (the police) that protects us and keep law and order. This author has authored 262 publications on Modern Ghana.